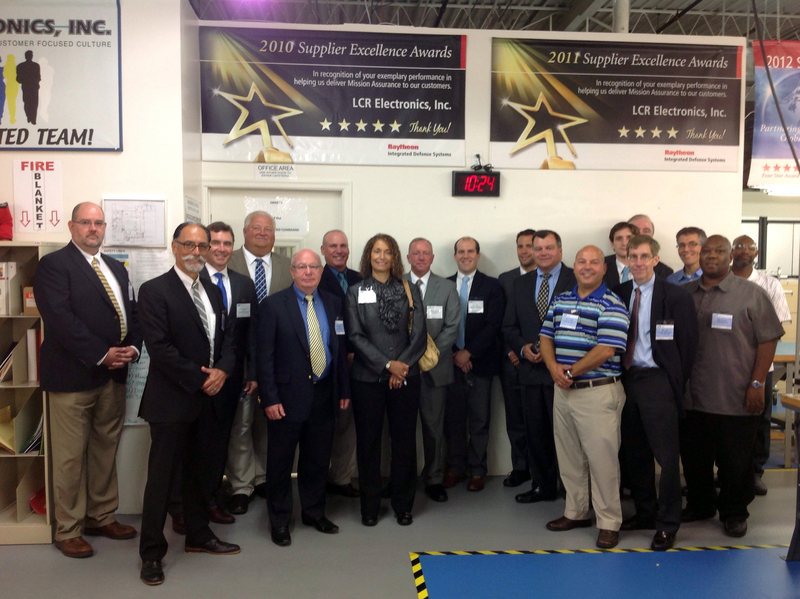 August 31, 2015 Norristown, PA – Executives from the US Navy’s Naval Sea Systems Command (NAVSEA) and the Raytheon Company, together with representatives from the United States Senate and the Secretary for the PA Department of Community and Economic Development, met on August 11, 2015 for a visit and tour at LCR Embedded Systems, a high-end electronics design and manufacturing firm based in Norristown. Also in attendance were representatives of the Workforce and Economic Development Network of Pennsylvania (WEDnetPA). LCR Embedded Systems has a long and positive relationship with Raytheon as well as with other major defense subcontractors, and during the visit and tour, the focus was on its suite of design, engineering, and integration capabilities as well as how its manufacturing and test capabilities, quick turnaround, and commitment to exceeding customer requirements enabled Raytheon to deliver some of the central hardware for the AN/SPY-1 Radar at the heart of the US Navy’s Aegis Combat System currently deployed on surface ships around the globe. Attendees included Kevin J. Kenney from the NAVSEA Program Executive Office for Integrated Warfare Systems; David Joseph, Director of Aegis Programs for the Raytheon Company; representatives for Senators Robert Casey and Patrick Toomey; and PA Secretary for the Department of Community and Economic Development Dennis M. Davin. Davin, Joseph, and Kenney all spoke at the event, addressing how the long and positive relationship between LCR Embedded Systems and Raytheon benefits the United States Armed Forces, its defense subcontractor customers, and the Pennsylvania economy. “LCR Embedded Systems is extremely proud to have played such a crucial role in enabling Raytheon and our other defense subcontractor customers to offer the best and most reliable technology to the men and women who place themselves in harm’s way to protect this country, and we look forward to playing that role in the future,” said LCR Embedded Systems President Nissen Isakov. Our electrical, mechanical, and manufacturing engineers can design and manage your build-to-spec or build-to-print requirements from obsolescence issues to cost reductions, and our US-based facility offers a cost-effective suite of design, manufacturing, integration, assembly, and testing capabilities. In addition, we offer a portfolio of fielded and proven standard products (VITA and PICMG Standards; VME, VPX, ATCA, CPCI) that can be modified to meet your unique requirements from rugged enclosures and high-speed backplanes to legacy architectures. Our focus on quality, schedule, and affordability, along with our strong desire to partner, will make you feel as if you are working with colleagues, all of whom are as invested in helping you achieve your mission as you are. LCR Embedded Systems is an AS 9100 C and ISO 9001 certified company, with approved J-STD-001 Class 3, FOD and ESD programs in place.